Multilane stick pack machines are used in many industries today for powder and liquid packaging. The stick pack format is popular for single-serve products which modern consumers love for their portability, convenience, and ease of use. Manufacturers and co-packers love stick pack machines because they achieve high throughput and conserve valuable plant floor space. But how does this equipment work? 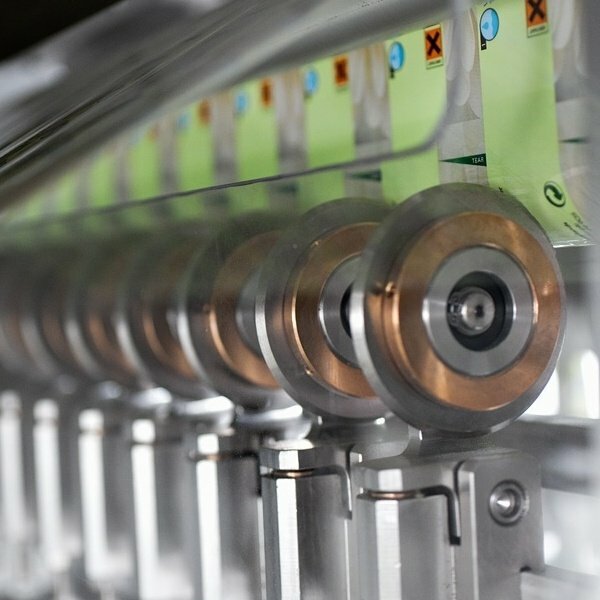 In today's article, we are walking through how a stick pack machine turns a single roll of film into multiple shelf-ready packages. 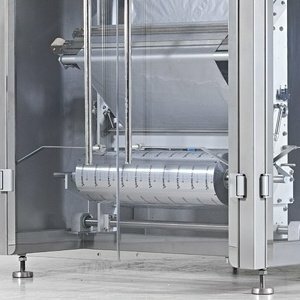 The operation of stick pack machines is very similar to that of single lane vertical form fill seal packaging machines: a roll of film is cut and formed into multiple stick packs, the bags are filled with product and then sealed, all in a vertical fashion, at speeds of up to 80 bags per minute per lane. With machines that can accommodate up to 20 lanes, a single stick pack machine can produce up to 1,600 stick packs per minute. That's over 26 sticks per second! 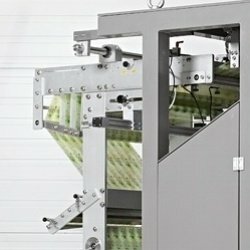 Stick pack machines use a single sheet of film material rolled around a core, usually referred to as rollstock. The film is unwound from the film reel, positioned at the rear part of the machine. The film unwinding process is done by means of movement of the cross seal jaws, located at the front of the stick pack machine. If the machine is equipped with a date-stamping device, the film is fed around a registration roller. This helps to register the position of the date stamp on the package in relation to the horizontal seal. The film is threaded over a sensor that reads eye marks and controls the position of the horizontal seal in relation to the printing on the film. Next, the film is fed through a set of nip rollers. The nip rollers keep even pressure on the film to help to keep it at a constant tension, thus keeping the dancer arm in the proper operating position. During unwinding, the film is unwound from the roll and passes over a dancer arm which is a weighted pivot arm located at the rear of the machine. The arm incorporates a series of rollers. As the film transports, the arm moves up and down to keep the film under tension while also ensuring the film will not wander from side to side as it is moving. From the nip rollers, the film goes into the cutting section. 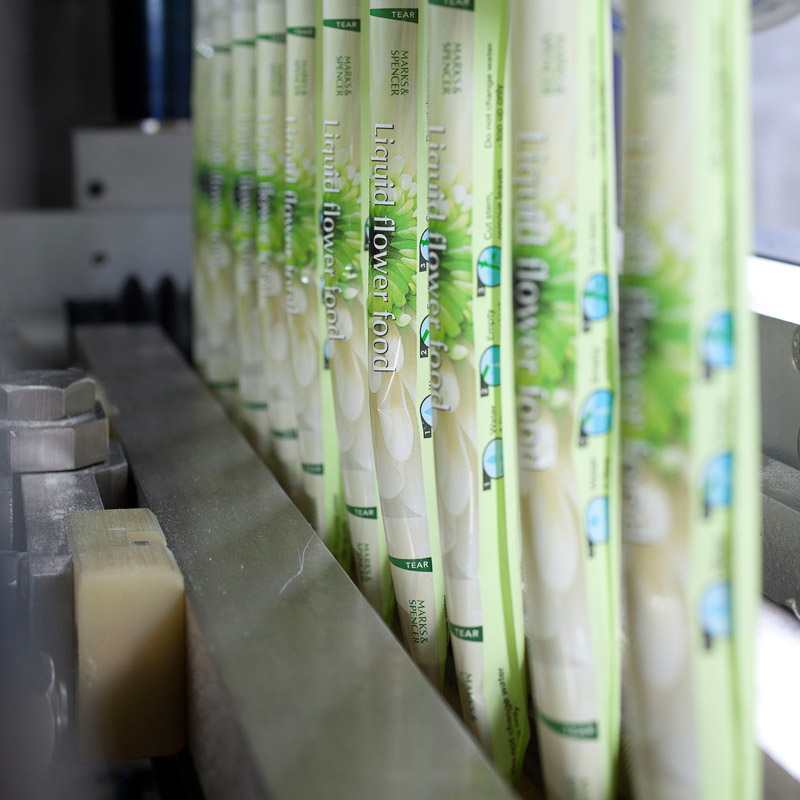 During this step in the process, the large roll of packaging film is cut into strips based on how many lanes the stick pack machine has. These strips form the basis for the individual stick packs. The cutting disk knives that complete this step are not motorized. The film, still kept under tension, is passed through the knives which are in contact with a specially designed roller. 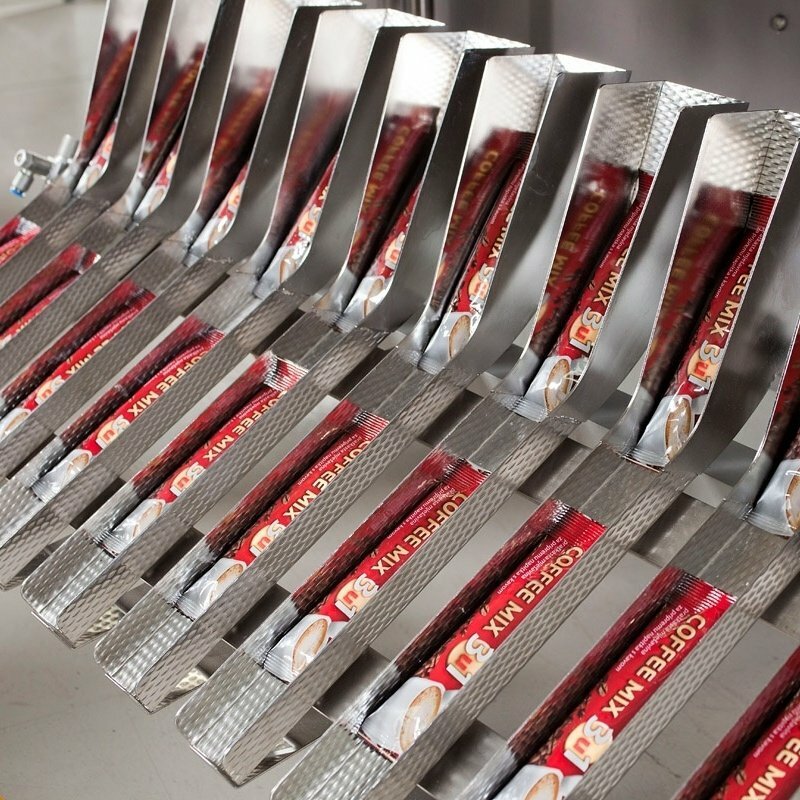 The film is cut into individual stick packs as it is pulled through this assembly. From here, the cut film passes over multiple forming tubes (one per lane). As the cut film crests the shoulder (collar) on each forming tube, it is folded around the tube so that the end result is a 'stick pack' shape with the two outer edges of the film overlapping each other. The forming tubes can be set up to make a lap seal or fin seal. A lap seal overlaps the two outer edges of the film to create a flat seal, while a fin seal marries the insides of the two outer edge of the film to create a seal that sticks out, like a fin. A lap seal is generally considered more aesthetically pleasing and uses less material than a fin seal. Once the film stops moving, multiple vertical sealer bars (one per lane), which are hot, move forward and make contact with the vertical overlap on the film. The vertical seal bar presses itself against the forming tube and makes the vertical seal. Then a single horizontal sealing jaw comes together to make the top seal of one stick pack and the bottom seal of the next one. 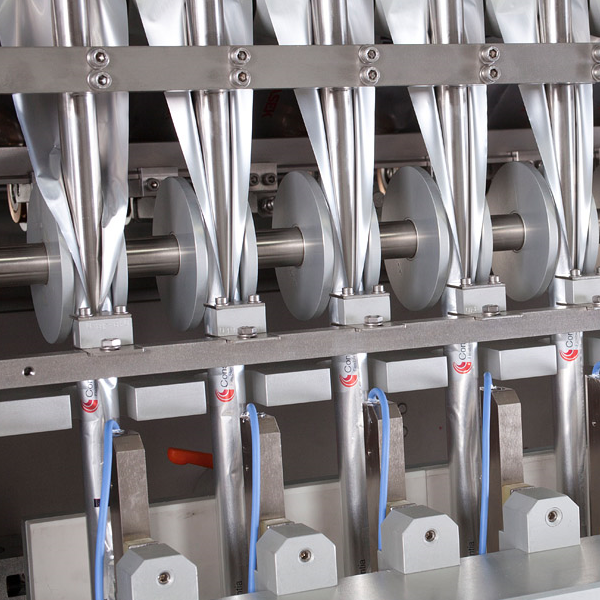 While the sealing jaws are closed, the product that is being packaged is dropped down the center of the forming tubes and fills each individual bag. A filling apparatus like a volumetric filler, liquid pump, or auger filler is responsible for the correct measurement and release of discrete quantities of product to be dropped into each stick. After the product has been released into each stick pack, the knife moves forward and cuts the bag or the horizontal seal is “notched” just under the horizontal seal jaw. Finished stick packs drop into the outfeed chute which has a flap that opens and closes at predetermined intervals, dropping the bags either onto an outfeed conveyor or directly into a receptacle. For a more controlled and oriented discharge of stick packs, individual outfeed chutes can be optioned. The completed bags can be fed into downline equipment like check weighers, x-ray machines, case packing, or carton packing equipment. Originally published 5/25/2017, updated 4/26/2018. 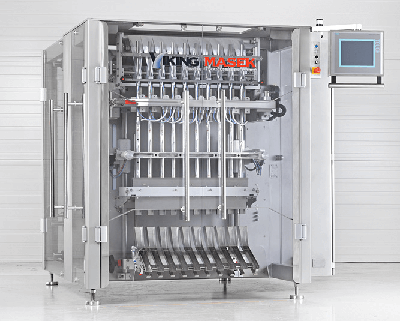 Considering Used Packaging Equipment? Read This First.